Croquettes de cervettes grises were light and airy, with a flavorful shrimp taste. A recent vacation to Belgium uncovered a couple of wonderful culinary treasures as well as introduced me to the ancient, historic and rapidly evolving city of Liege. My girlfriend (and rapacious dining companion) Jane Rothchild and I arrived in Leige hungry after a beautiful half-day train ride from Munich. A little research and a yearning for "classic French" led us to designate Le Bistrot d'en Face as the dining destination for our first night in town. Le Bistrot d'en Face is named after a noted French restaurant on Rue de Finlay near the Eiffel Tower, but there is no business connection between the two. 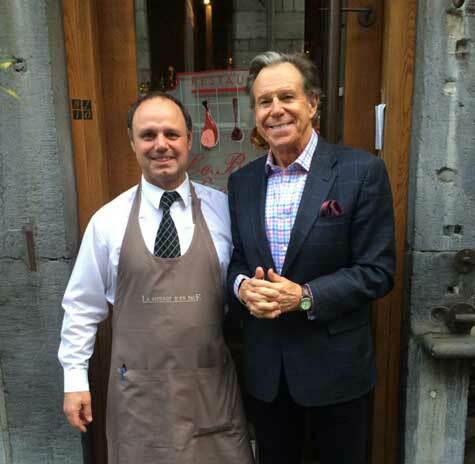 Owner Thiery Maree simply liked the Parisian spot and baptized his Leige bistrot with its name. The restaurant is tucked into a very quiet pedestrian street and it is housed in an ancient mansion. We chose to dine outside on a lovely Sunday evening. The atmosphere inside is charming and convivial, but after the trip we wanted some fresh air. This food is prepared in the tradition of "bouchons Lyonnais," and you will find yourself confronting a menu totally in French. No worries. The charming and dedicated multi-lingual Thiery Maree (pictured) serves as host and carefully attends to the needs of each guest at each table from arrival to departure. His executive chef, Sylvain Galere, has perfected French classics, and it should be noted that they are priced at good value. You might pay double for the same meal at a comparable restaurant in Paris. Of particular note among the appetizers were croquettes de cervettes grises (top), light and almost airy with a flavorful shrimp taste. The terrine de foie gras is a classic version of a dish that has mostly disappeared from American menus. Steak tartare is offered as an entree, as is a tender filet mignon with a classic sauce Béarnaise. As long as I am patrolling the classics, I would also recommend the duck — cuisse de canard, confit, pomme sarladaises. As you peruse the menu you will make a notable discovery. It is wonderful to be in a restaurant listing dishes that are paying homage to Paul Bocuse and Georges Simenon, two of the top French toques of the last fifty years. The creation listed with Chef Simenon's name is fete de veau a la Francaise, a dish he prepared frequently for French president Jacques Chirac. The entree ascribed to Monsieur Bocuse is parmentier de queue de boeuf et foie gras. Designations like these are a brilliant idea, and I wonder how long it will take for the celebrity chefs in America to find some of their notable creations appear on menus other than their own? I will be writing more about my visit to Liege, Belgium in my next column. We loved our meal at Bistrot d'en Face, as well as our time in Liege. The city has great allure and deserves a visit as much for its food as it does for its art and history.